Ben Platt was the strange looking weirdo in the musical drama Pitch Perfect. Before his Pitch Perfect fame, he was already popular on Broadway for his role as ‘Evan Hansen’ in Broadway Musical Dear Evan Hansen, which earned him great critical acclaim as well as some accolades. Before his career kicked off, Platt like his counterparts passed through some hurdles which he eventually overcame. While we would be dwelling on that, there are speculations about the personality and sexuality of the actor, given his unusual looks and attributes. Find out what’s what. He was born Benjamin Schiff Platt on September 24, 1993, to his parents; Julie and Marc Platt. Ben who was the fourth of five children toed the line of his parents who are into entertainment. While his mother is a singer and a theater artist, his father is also a film and theatre producer who produced the musical, Wicked. When he was 9, he featured in The Music Man as ‘Winthrop Paroo’. At the age of 11, he was seen in Janine Tesori and Tony Kushner’s ‘Caroline, or Change’ tour. He attended the Adderley School for Performing Arts, where he got involved in productions like ‘Into the Woods’ and others. He attended Harvard-Westlake School, after which he proceeded to Colombia University. Not taking chances on his passion, he left the university after six weeks in order to meet up with his agreement with musical comedy ‘The Book of Mormon’, which premiered in December 2012, at the Bank of America Theatre. His performance in the production was well received by critics. That same year, he landed a supporting role in the musical comedy Pitch Perfect, where he played the character of ‘Benji’, a magic-obsessed fellow. He reprised the role in the sequel Pitch Perfect 2 which was released in 2015. He featured in the musical Dear Evan Hansen in 2015. The talented actor signed a record deal with Atlantic records in September 2017, after which he fully ventured into the music faculty. One of his music stints includes a live performance of Leonard Bernstein’s ‘Somewhere’, alongside artists Adele Stein and Justin Goldner at the 60th Annual Grammy Awards. He appeared in an episode of Will and Grace in 2017. Ben Platt is reaping the fruits of his perseverance in the business. The actor and singer sits on an estimated net worth of $7 million. Per analysis, this is likely to become a trifling figure to the actor in the coming years, as he is still steps away from the climax of his career. See Also: Jim Parsons Net Worth, Married, Husband, Wife Or Boyfriend, Is He Gay? There have been speculations about the sexuality of the actor who exudes a delicate and subtle aura. It’s not only about his looks, but his weirdness which he never hesitates to own on set. Ben Platt is one actor who always has viewers roll their eyes in confusion as to how one can pull off such weird roles. There’s more, he is also indifferent on talks about the LGBT community. This is why some think he is gay. During the 2017 Tony awards where Platt bagged the Tony Award for ‘Best Actor in a Musical’, the talented actor during his acceptance speech, encouraged young people to embrace their strangeness because that is what makes them unique. His note has been misinterpreted by many to be an advocacy for the LGBT community. But the actor has in no way reacted to all these speculations as he is quite busy with his new found fame and flourishing career. Who is The Girlfriend or Boyfriend? Having deliberated aloud into the personal life of the actor, let’s see if there are some facts to prove or disprove these rumors. Platt is quite private with his personal life and spares no information to the media regarding his personal relationships. However, the actor is said to be very close to Beanie Feldstein, his friend since high school. Ben and his friend Beanie who appeared in the movie ‘The Ladybird’, have featured together in some Broadway shows. The two have made several appearances together stirring relationship rumors. But they seem to be just friends. However, none of them has confirmed nor debunked the rumors. 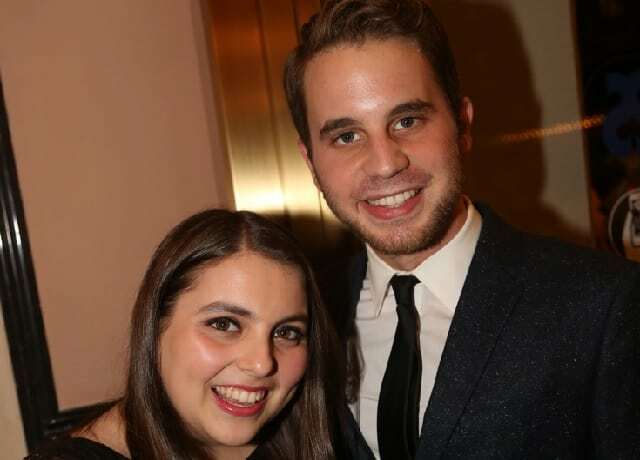 Ben Platt may have a delicate and subtle look but surely has a good body that suits his career. He stands at a height of 5 ft 9¼ in (176 cm), which is quite proportional to his weight of 69 kg (152 lbs).